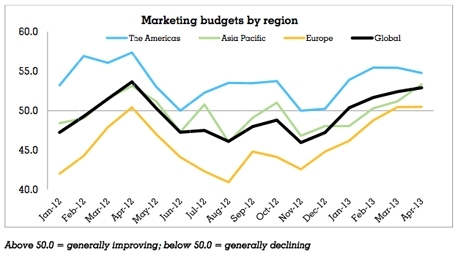 April’s Global Marketing Index (GMI) scored marketing budgets at 52.9, up from 52.4 in March. The Americas recorded the strongest outlook at 54.8, while Asia Pacific experienced its third consecutive month of growth with the index rising to 53.3. Meanwhile, Europe held steady at 50.5. A reading of 50 would indicate no change. There was further good news for Europe within the index as trading conditions in the region showed a more positive reading than Asia Pacific for the first time since the index began. Europe scored 58.2 compared with Asia Pacific at 56.4, while the Americas remained the most optimistic at 61.8. The overall global headline GMI measure registered a slight decline of 0.4 coming in at 56.5, with the Americas registering 58.7 and both Asia Pacific and Europe measuring 55.1.